No, all customers must be 18 years of age or older. We do not tattoo minors. We accept all major credit cards. We currently do not accept Apple Pay. Do I have to be sober? We take walk-ins based on availability each day, So be sure to call the shop to make sure we have time that day. The tattoo deposit is not refundable, and will be kept by the artist working on your custom piece in the case of cancellation or no-show. Your shop deposit pays for the artists time, and secures your spot with the artist. Each artists spends ample time drawing, preparing, and customizing your fine art tattoo, and this deposit secures that time. The deposit does come out of the price of the tattoo during your final session. Each artist is blood born pathogen certified. All equipment is single use and disposed of after each individual use. Our shop keeps to an impeccable practice of cleanliness and sanitation, and even employs a professional cleaning service to keep to the highest standards. We are like THAT good. How do I heal my tattoo using Vitalitree ointment? If your artist instructed you to use a “wet healing” technique, you will wash the tattoo with anti bacterial soap then pat dry with paper towels and apply a small amount of Vitalitree 3-5 times a day for 7 days. Vitalitree is a natural, effective healing product line that uses organic candela, tepezchouite extract, and chamomile to remove swelling, and aid your tattoo in healing quickly and safely. How do I heal my tattoo using tegaderm? If your artist wants you to heal this way, the artist will supply you with the tegaderm. The first piece will be placed on your tattoo immediately following your appointment. After 24 hours, or if it starts leaking, Clean and dry your new tattoo and surrounding skin, no lotion or ointment is necessary. Peel off the paper backing of Tegaderm to reveal the adhesive side, Gently apply over the tattoo, leaving about 1 inch of the bandage in contact with undamaged skin around the tattoo. The first piece of Tegaderm should stay on for 8-16 hours, depending on how much the tattoo bleeds. It’s normal for blood and fluids to collect under the bandage, The 2nd piece can be worn for up to 4 days. Which artist is best for my tattoo? To decide which artist you should pursue for your custom artwork, first you should decide which tattoo style you want your tattoo to be. Join me on an educational voyage through some popular tattoo styles! Some of the oldest and most well-known Western tattoo style. It follows a strict set of design rules that make it easy to identify, such as a limited but bold color palette, thick black outlines, immaculate precision and two-dimensional, crisp images. 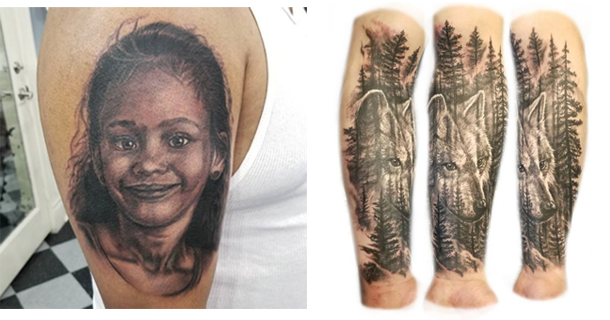 Creating tattoos with photographic detail and astonishing technique, a number of our artists specialize in realism. Realistic tattoos are meant to look as convincing as possible, often featuring portraiture, landscapes, and animals. This popular style of tattooing takes impressive skill to make your tattoo look like an amazing representation of the subject of your tattoo. 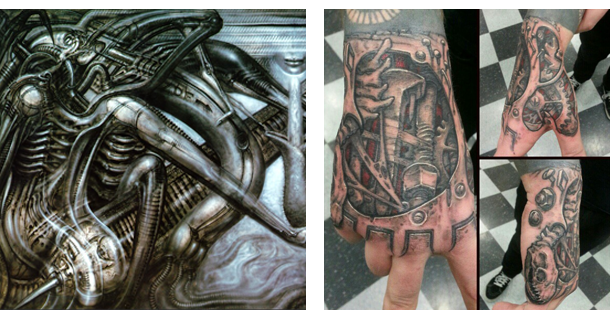 Where sci-fi and reality meet, lies the style of biomechanical tattoos. Inspired in part by H.R. Giger’s artwork, and design for the 1979 Alien film, the design of the alien characters was so groundbreaking that it inspired a new form of tattoo art, in which artists create images that mix realistic human or animal anatomy with the inner workings of machines. 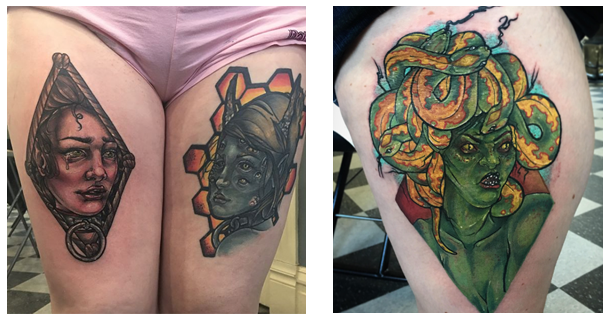 Frightening, interesting, and darkly ethereal this form of tattoos brings a level of scientific fantasy to your piece. The elegant, updated cousin of the original old-school style. This modern style of artwork stays true in many ways to its predecessor, featuring bold black lines and a limited, classical color palette. These designs often feature three-dimensional images and a more expansive subject matter. 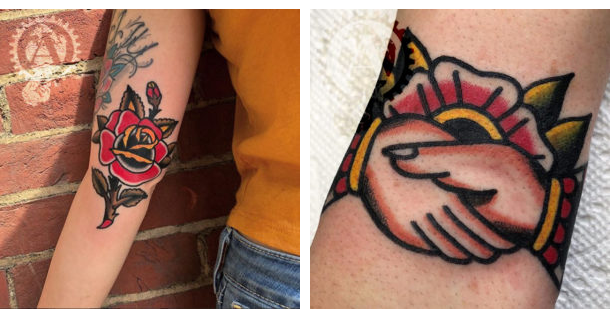 This tattoo style is flexible, and updated for a more intricate design than it’s traditional ancestor. What am I getting into exactly? Tattoos hurt, right? Yeah, they do, but you can totally handle it. Realistically, it feels like a touch of pain coupled with an annoying, intense vibration and the sensation that someone is dragging a needle across your skin. Cause, you know, they are. However, if you stay hydrated, and focus on breathing through the more uncomfortable moments, you will come out triumphant and with an awesome new tattoo! What if I want a large tattoo? Large tattoos are a very rewarding process, though it can be intimidating. Even if you’re not ready for an 8 hour full sleeve session, make sure to communicate with your artist if you have larger plans for your piece. Each artist can work with you by working on your large tattoo project in stages for those financially, physically, etc. unable to do full day sessions. Having a consultation with your artist is a great way to plan out larger projects! I'm scared, How can I survive my tattoo session? Self-care is also important during the day of the tattoo session. Eating an ample and nutritious meal beforehand provides the body with what it needs to sustain energy and pain tolerance. It also maintains adequate blood sugar levels, which combats the adrenalin rush that often comes at the beginning of a tattoo session. Without this boost, that adrenalin rush leads to a higher likelihood of getting light-headed, sick, and/or passing out. Bringing some food and drink to snack on later in the day, when you’re pain tolerance and energy levels start to ebb, can also make a long tattoo session easier. How much does a tattoo typically cost?